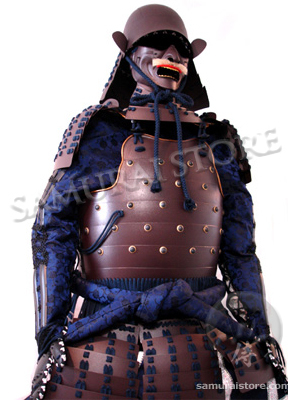 This armor was designed in Warring States Period, for the purpose of the defense against firearm attacks. This solid armor has a simple design without any fancy decorative items and is finished with ironrusting brown painting and dark navy braid lacings which can make it look like a manly sporting armour. The body armor is hand-finihsed with some iron rivet fastener to enhance its strength. Featuring a Zunari, or “human head-shaped” kabuto, here is your chance to own one of the most popular helmet styles amongst the warlords of Japan’s Sengoku Jidai (Warring States Period). Even those not as well versed in Japanese history may find this kabuto familiar, as it is said to be the design inspiration behind the helmet of Darth Vader. This suit's body armor is constructed by hand, using multiple iron pieces, beautiful lacings and elaborately crafted chainmail. This Yoroi armor comes with all parts and accessories listed in the charts below, and can be worn.